Mitzi came to us as a nervous cat; although she appears friendly from the outset, she will lash out unexpectedly and bite. Sadly this happened twice when she went to new homes. 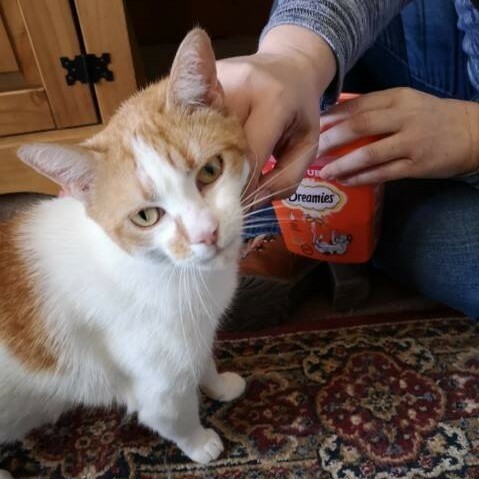 The third time, the new owners gave her plenty of space and worked hard to gain her trust and this paid off and they saw the real, affectionate little cat. Sadly though, she won't accept the other cats in the household so very reluctantly we are now seeking another home for her. Her current owners are convinced that in a quiet home with no children or other pets and a sensible & understanding owner, Mitzi will flourish. We believe it's possible that she's been mistreated in her past and has trust issues, so she needs lots of time to learn to trust someone new. She needs time and space to settle. Mitzi is 4 years old and is fully vaccinated and spayed. She is a very affectionate girl and deserves her chance in an understanding forever home.